ultrasun Family SPF30 High sun protection sensitive skin with antioxidants 400ml, a sun lotion for all the family to share, even those with very sensitive skin. Super sensitive and lightweight, the ultrasun Family SPF30 all family sun lotion is easily absorbed and isn't sticky or greasy. The high all-day protection of UVA 93% and UVB SPF30 together with its water resistant formula makes this sun lotion the perfect companion for the summer and the airless pump dispenser prevents the product from contamination, which is ideal for sensitive skin. Like other Ultrasun products, it is non-staining, non-greasy, water-resistant and easy to use. 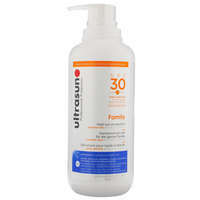 Previously called ultrasun Family SPF30 All family sun lotion for very sensitive skin. 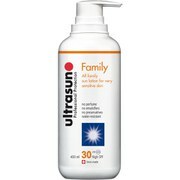 ultrasun Family SPF30 High sun protection sensitive skin with antioxidants 400ml was found on 5 websites and was price compared using EAN: 0756848462363. The cheapest ultrasun Family SPF30 High sun protection sensitive skin with antioxidants 400ml is shown as the main item, prices range from £39.10 to £46.00, excluding delivery. Price comparison based on price and delivery charges, with any valid discount codes being applied, is shown in the table above. Prices and information correct at the time of publication.